After printing this image I tried to imagine whether the scene would have appealed to three of my favorite artists, Edward Hopper, Grant Wood and Andrew Wyeth, each whose work may be considered an example of modern American realism. 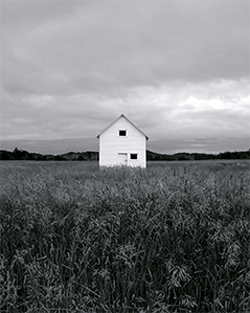 I think the almost surreal landscape would have attracted Wyeth; the nostalgic throwback, Wood; and the solitude of the scene, (especially the isolation of the towering outbuilding), Hopper. I mention these artists because, for many years I’ve been drawn to their work and suspect it has influenced the way I see landscapes and architecture. This outbuilding resides on the property of Carsten Burfiend, the first settler of Leelanau County, Mr. Burfiend built two farms in the late 19th century just north of Glen Arbor. 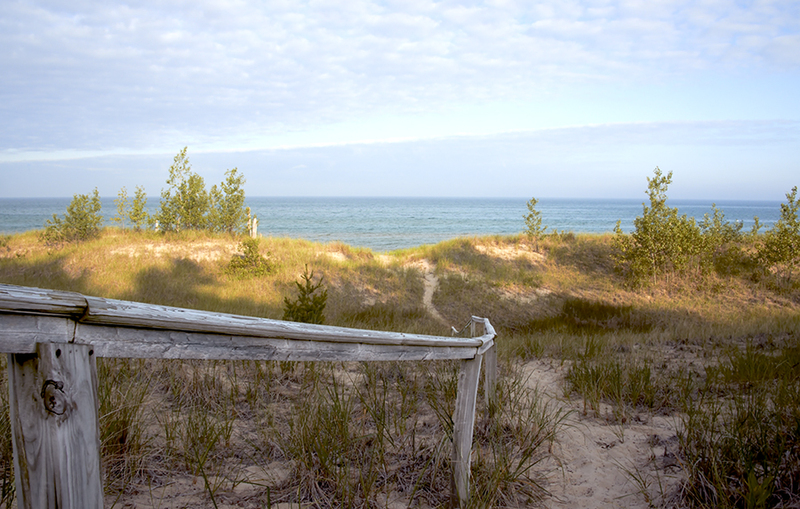 The farm is closed though restored and sits between a spine of dunes to the east and Lake Michigan less than a mile west. I printed this recently for the first time as a large format (48″x38″) using archival pigment ink and canvas. It is on display in Still Point’s exhibit space at the moment. 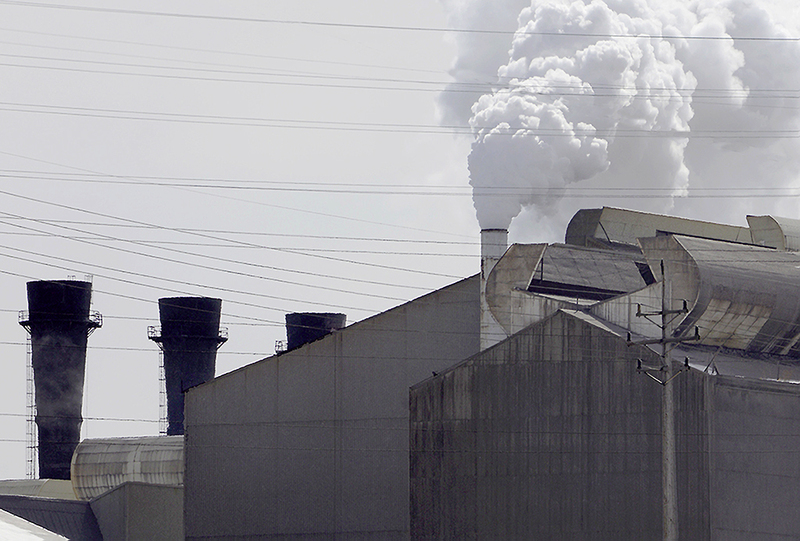 Early February provided a perfect day to photograph smoke stacks at the former J&L Steel melt shop and rolling mill on the west side of the Cuyahoga river. Purchased from “Otis Steel”, J&L’s mill was home to thousands of steelworkers and millwrights since 1942. Over several generations the facility has been through numerous incarnations, the most recent of which was its acquisition by LTV Corp. (a consolidation with Republic Steel in 1984), a shutdown in 2002 pursuant to ISG’s purchase and finally the eventual acquisition by Luxembourg-based ArcelorMittal and the mill’s reopening in 2004. The billowing “smoke” animating the image is really only steam as the morning’s low air temperature (-10°) created ideal conditions for condensation. The shot reminded me a little of a Braque or Picasso Cubist painting … each of the pieces reassembled, seemingly creating more than the sum of its parts. There is something ironically anthropomorphic about the structure with its jaws turned skyward and hot breath billowing in successive bursts. I resisted the temptation to include the sprawling length of the mill in a landscape format. And finally, rather than producing this as a black and white image, which would have reduced the image to a study in “shapes,” I retained the colors to add tonality and dimension. Not a sound at the marsh today (January 1st, 2017). 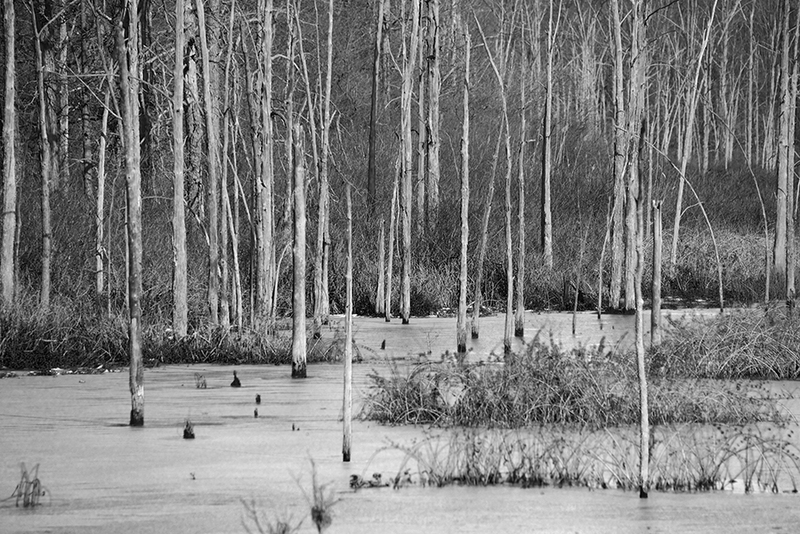 Hundreds of acres covered with a thin sheet of ice, perforated only by tiny islands of marsh grass and dead pin oaks. The few remaining geese and ducks have moved to the open water of lakes and rivers. Not a sound, not even “the sweep of easy wind …”. Groves of dead oak still stand in silence after more than fifty years, gray with age but unaffected otherwise. Today’s blue sky and early afternoon light accentuated the bleached wood and made for a dramatic black and white image close to shore. The blanket of snow last year (see “Sentries” https://stillpoint-gallery.com) contrasts with this first landscape of 2017 – ineffable beauty waiting for us in the starkness of the season. Among the blessings conferred by early morning excursions into the marsh has been the opportunity to observe Red-Winged blackbirds as they usher in the day with their first notes. In the morning twilight, almost an hour before sunrise, this blackbird was first to rise from the marsh to greet the morning with its song. Abruptly, the landscape erupted in a cacophony of disparate songs; harmony in its dissonance. 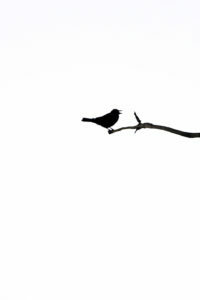 Isolated on a dead pin oak before sunrise and silhouetted, Kirie-like against the eastern sky, its colors were indiscernible. It made more sense to process this photo in black and white without the slightly hued and muddled colors of the predawn sky. This is a moment I wish for everyone. We are excited to be home but grateful for two weeks in France and Spain which included a couple of days in this extraordinary town of Arcos de la Frontera. 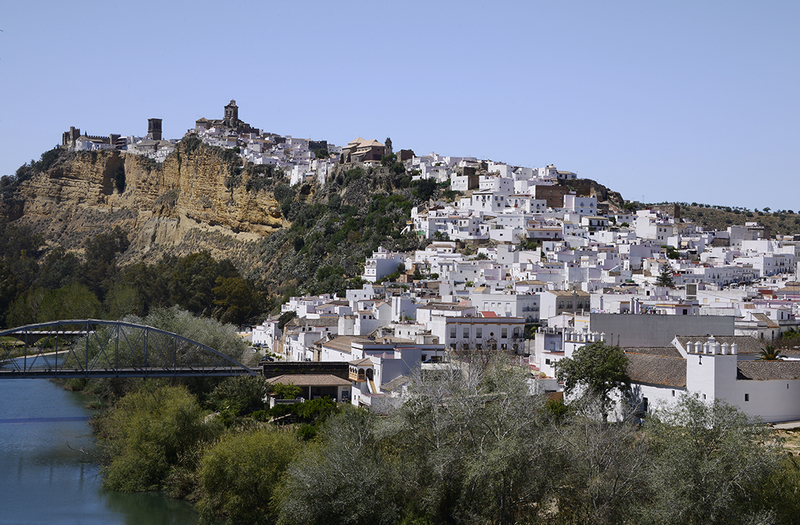 Arcos, considered by many to be the most beautiful of the “White Hill” towns, is about sixty miles south of Seville and less than an hour from the Mediterranean. The Rock of Gibraltar is visible to the south and west. This image is deceiving as the town of Arcos spills down the side of the mountain from an altitude about 1,200 feet above the Guadelete river. In the lower left foreground is a small bridge built in the late 1800’s by Gustav Eiffel, the architect of the Eiffel Tower. Arcos is fascinating historically as it was built by the Moors and later expanded by Christians. After centuries of battle, the Moors were pushed back into Africa in the late 15th century. The older section sits on top of the mountain (a mile from the homes in the foreground) with the Castile of Arcos and the churches of Santa Maria and San Pedro just visible (above left) in the distance. Over the next few weeks, we’ll post several images we hope you’ll find interesting. 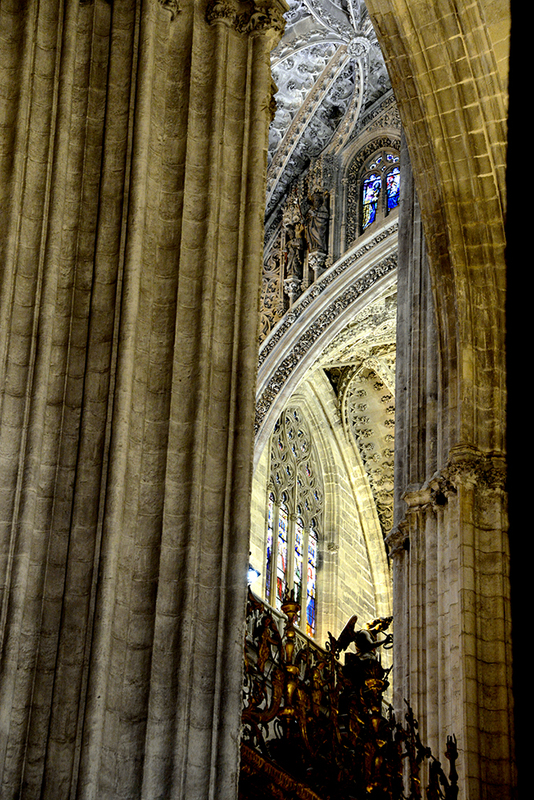 Europe’s third largest church and the largest Gothic church in the world, Seville’s cathedral is a “must see”. It was built by the Catholics over the course of the 16th century using architectural remnants from a century long war with the Moors. The Cathedral is adjacent to The Alcazar and adjacent to the famous Giralda Bell Tower.